Divyatattva.in brings you description and meaning of Tarot Suit Card " King Of Swords". Reversed: Can be Manipulative, controlling, harsh, unethical, corrupt, Tyrannical, Abusive in nature. Personality of Court Card King of Swords: Stern, Disciplined, Impartial, Calm, Poised, Has Ethics and Difficult to Corrupt. 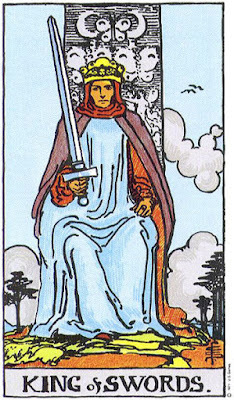 Professions of King of Swords: Can be judge, lawyer, Police,professional advisor, such as a solicitor or attorney, financial adviser or taxation consultant. or military commander. He offers the rigour and specialist knowledge in his field. Divyatattva.in tarot card readings in India, tarot card reader New Delhi, Yearly predictions with tarot cards, monthly forecasts, predictions for 2016, Prophecies and online tarot reading. Get your personalized tarot cards reports on love and relationship by India's best tarot card reader Shri Rohit Anand Ji. Divya tattva is the top trusted website for getting tarot cards consultation to all your queries and questions with regard to Career, job, education, money, wife, divorce, husband, soulmates, living abroad, love affair, promotion, child birth and life. Get your Yes or no tarot card readings, free tarot cards interpretation with description and meaning exclusively at top online tarot and astrology website in Chennai, Kolkata, Chandigarh, Ghaziabad, Mumbai, Gurgaon, NCR, Jaipur, Meerut.